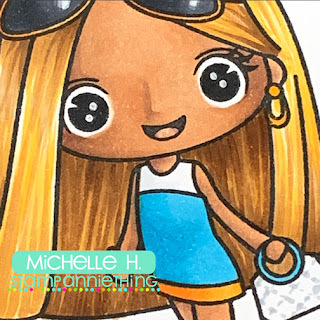 I colored in "Annie - special delivery" with my copic markers and chose colors to match my background paper which from "Doodlebug's French Kiss 6x6 pad". I think this makes the perfect Valentine's Day card to mail out!! Hello all you Stamp AnnieThing friends! Michelle Houghton checking in on this fine hump day to share a little SAT inspiration! I am creating a fun card with this month's amazing release. 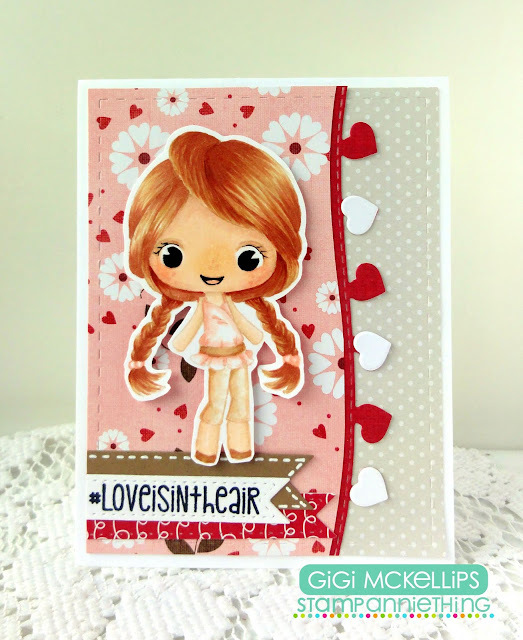 The stamp is Kimmie - So Jazzed and she is GREAT for practicing coloring long hair! Love her gorgeous long straight hair. 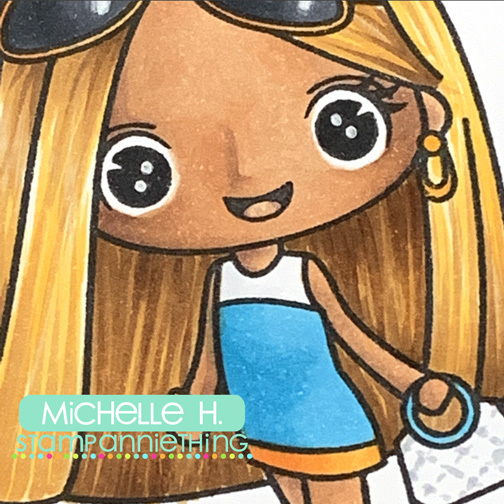 I am coloring with my Copic markers to color her up and then I used a few simple patterned papers for a bright cheerful base. 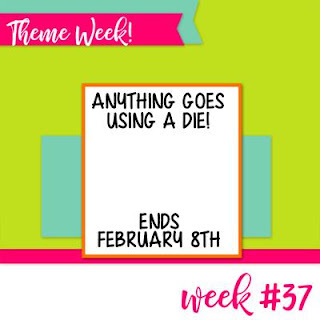 I also used this month's word die Smile! I mean who can't use a smile through the mail?! E11, E13, E15, YR31, Y21, YR24, E33, YR04, YR07, BG02, BG05, C1, C3, C5, C7, C9, Colorless Blender. I created the quilted look on the purse just drawing short dashes with my C3 Copic. Here is a look at the completed card: Yep clean and simple! Thanks so much for stopping by today! Hope you are having time during the cold winter months to get crafty with your Stamp Anniething favorites! Hey Everyone! It's Candace from Candi O. Designs and it's my day to post over at Stamp Anniething. This Valentine paper ~ Formula for Love was perfect to make a card and use Taylor ~ Think Like a Proton. I added the sentiment from Jaded Blossom to one of the Abstract Splatter Band dies of Stamp Anniething. Made a cute Valentine Card! Hi everyone! 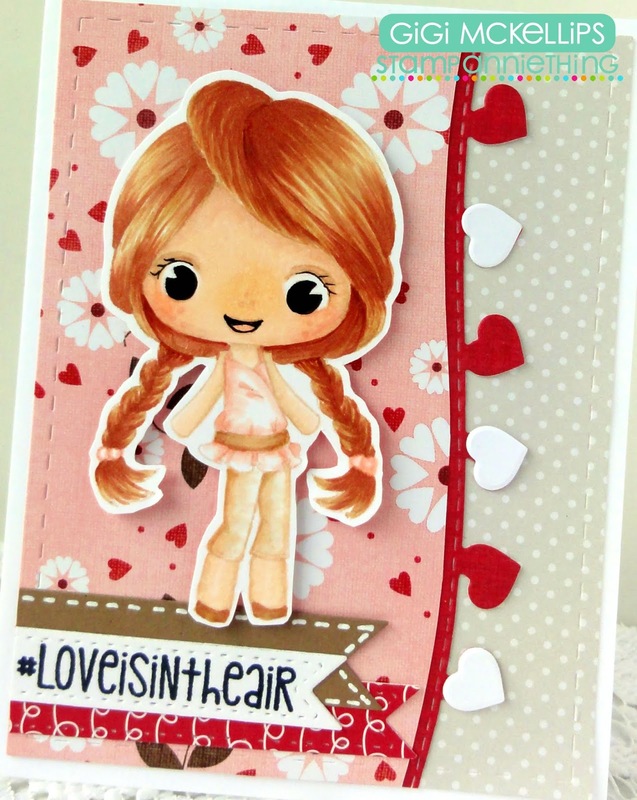 It's Meg here, and today I'm sharing another Valentine creation with you, using Chloe & Sam. I kept it simple, and used only the Falling Hearts stencil too, allowing the characters to take center stage. I love that the stencil is etched deep, which means that using a glitter paste results in a lovely raised image! Here, I've used Nuvo Moonstone. We put together a compilation of some wonderful items for your subscription box this release! 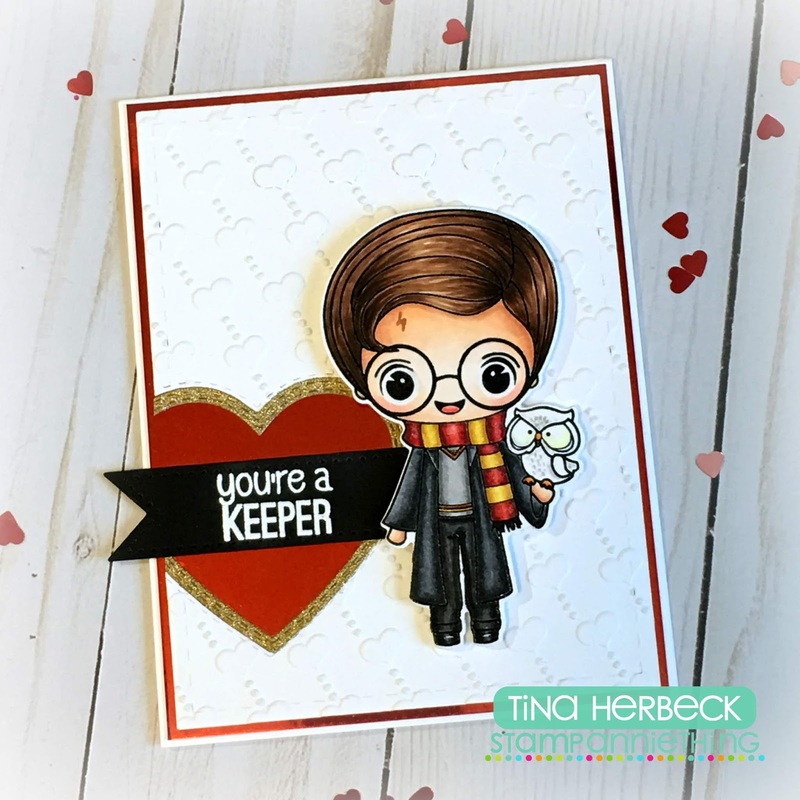 Our images are so adorable and reflect some of your favorite pop culture icons. 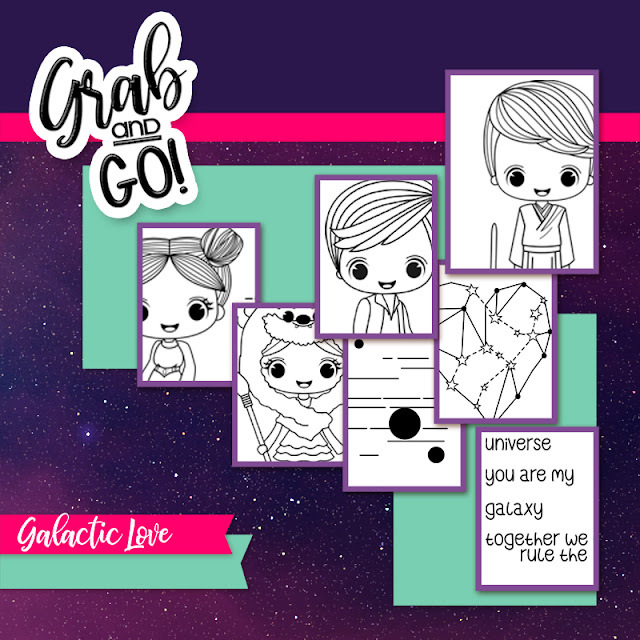 Here we have Galactic Love that will work for your upcoming Valentines Day projects as well as any "galaxy" movie fans in your life! For more details what the box includes, please visit the website for a complete listing! simply grab your box and GO to get started! VALUED over $150 in products, you are getting a great deal buying the box directly! Here is our DT Blog line up so you can see all the WONDERFUL projects you can create using items from the Galactic Love box! Hi everyone! This is Tina from The Scrappin Rabbit blog and I have a Valentine to share featuring the adorable Sam You're A Keeper stamp from the Grab and Go Wizard's Box. 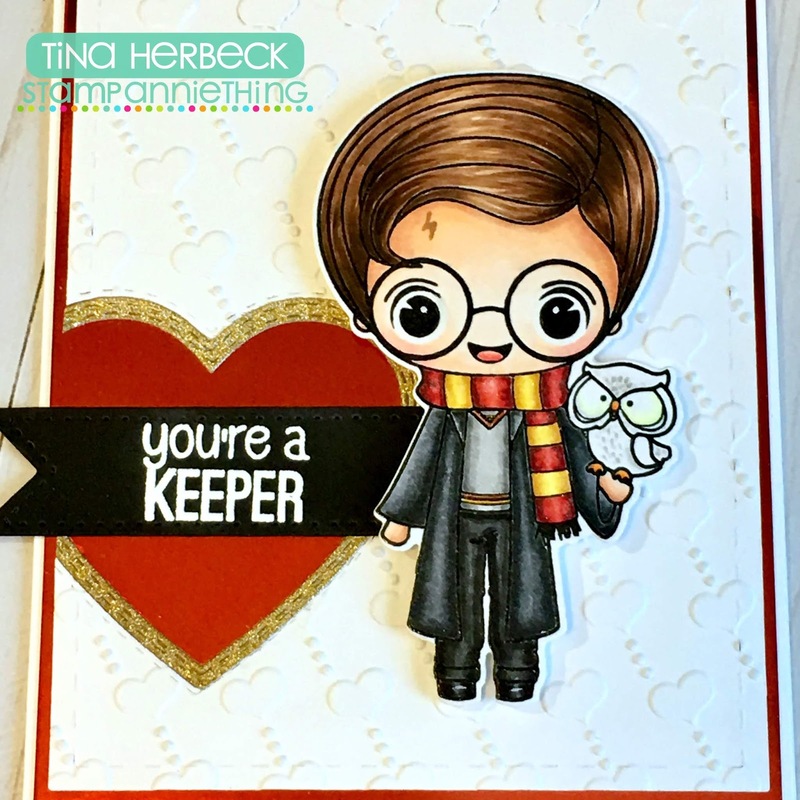 I stamped, embossed and colored him using Copics. I used Heart Dies 1 and 2 from Jaded Blossom to cut out the heart into the side of the white card stock layer. Next I ran it through my Cuttlebug using a Darice hearts embossing folder. I cut the next layer out using red foiled card stock. I made the heart border using gold glittered card stock. I stamped and embossed the sentiment onto a banner from Jaded Bossom's Card Layer Dies 1 and finally added lots of sparkle to the scarf. 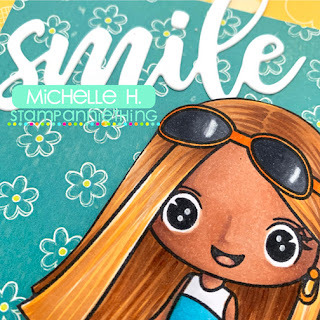 I used the Brooke-Smile stamp set to create my card. I added in the heart edge using the Heart Reverse Metal Die and added white mats to every other heart. 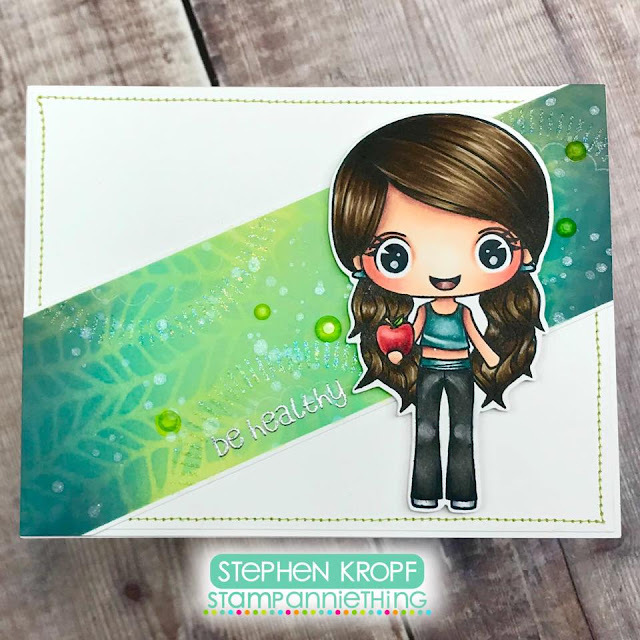 I do a no line stamp and color on Brooke and added her to the card on pop dots. To finish, I added some banners cut with the Card Layer Dies 1, Flag Dies 2, and stamped the sentiment from the Cupid Gotcha stamp set. 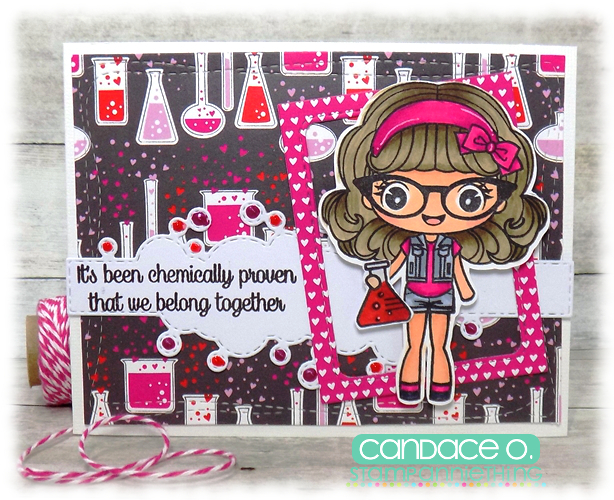 I have a card to share with you today that I had a whole lot of fun creating. I know we are half way through January already and we usually use this time of year to kick start some resolutions. 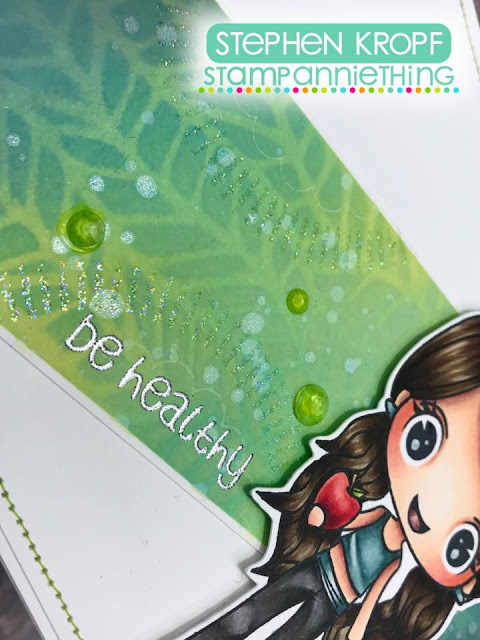 Whether it be eating healthier or to exercise more, I thought that this stamp set is perfect to encourage those who chose to live a healthier life. I stamped out Felicity - Be Healthy and coloured her with Copic markers. 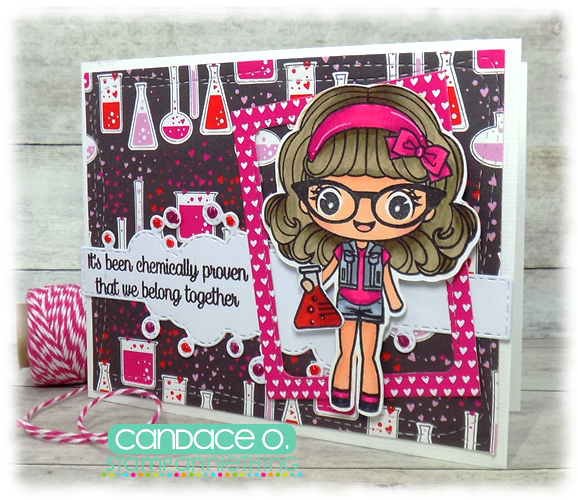 The background is created using Distress Oxide inks, stencils and clear glitter embossing powders. To finish off my card, I added some stitching around the boarder of my card layout using my sewing machine. I hope you like my card creation for today! I used some older Doodlebug paper and chose my copic marker colors to coordinate with the background paper. We don't get snow here often where I live but it is only an hour's drive away when we want to escape and play in it!! Hope your day is warm and toasty!! Thanks so much for stopping by today!! Hello my Stamp AnnieThing friends, Michelle Houghton here to share a little SAT inspiration. I had so much fun creating with this months images. I missed the opening days of this months release so I am super excited to get to share a few creations over the next several weeks. This week I have "Bridget Hang Loose Today" popping by. 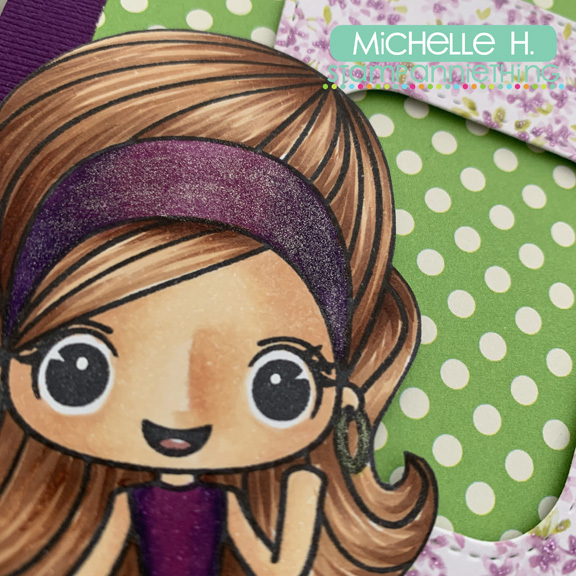 I colored her up with my Copic markers then created a very simple card base with one of the new dies this month. I added a little shine to her accessories and opaque white to the reflection in her eye before I finished her up as well. Hey Everyone! It's Candace from Candi O. Designs and it's my day to post over at Stamp Anniething. 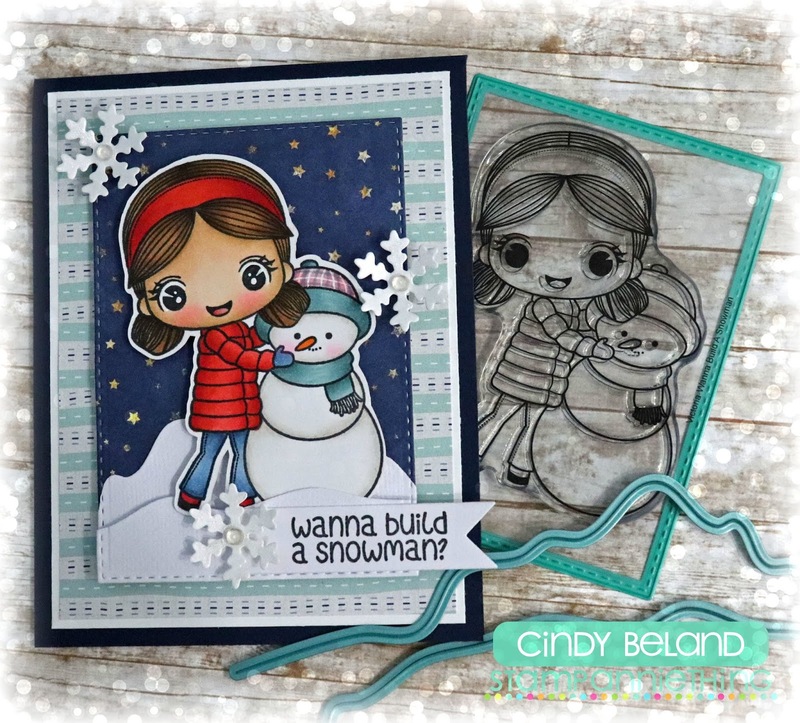 When I think of January, I think of snow and Thank You cards from the Holidays so I created this Snow Thank You card using Victoria ~ Wanna Build a Snowman. With the scene background, she was perfect!! Hi everyone, it's Meg here with you today! Since the holidays are now over, I start to look forward to Valentines Day, and I like using stamps for love cards that might not be expected. Here, I've used You Are Fintastic from the Mermaids theme release this summer to create a fun, under-the-sea Valentines card. For this design, I also used a variety of stuff from the shop - the Shaker Basics Set 1, Falling Hearts stencil, Snow Diamond Sparkles, and ocean floor and corals dies also from the Mermaids theme release. Hello Everyone! 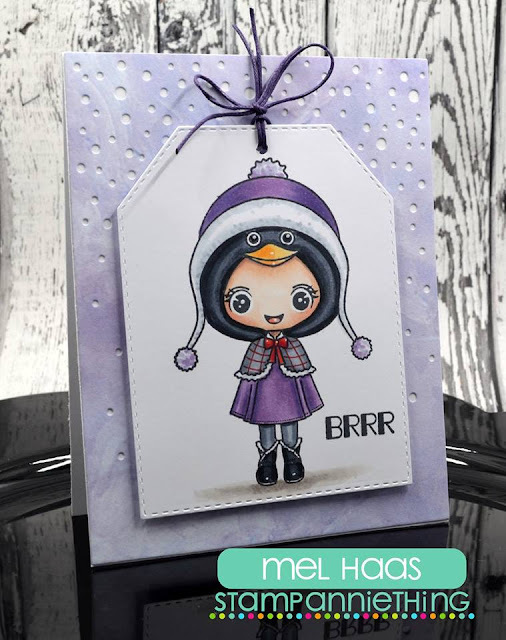 Mel from Doxie Mel Designs with a new card idea for you today. I colored up the cute Penguin - Have a Ball stamp from Stamp Anniething. She is colored with Copic Markers. I am playing along at the first Challenge of the year at Stamp Annithing. 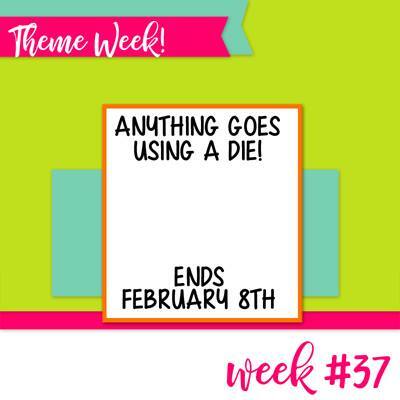 Challenge 37 is and "Anything Goes" with a die. 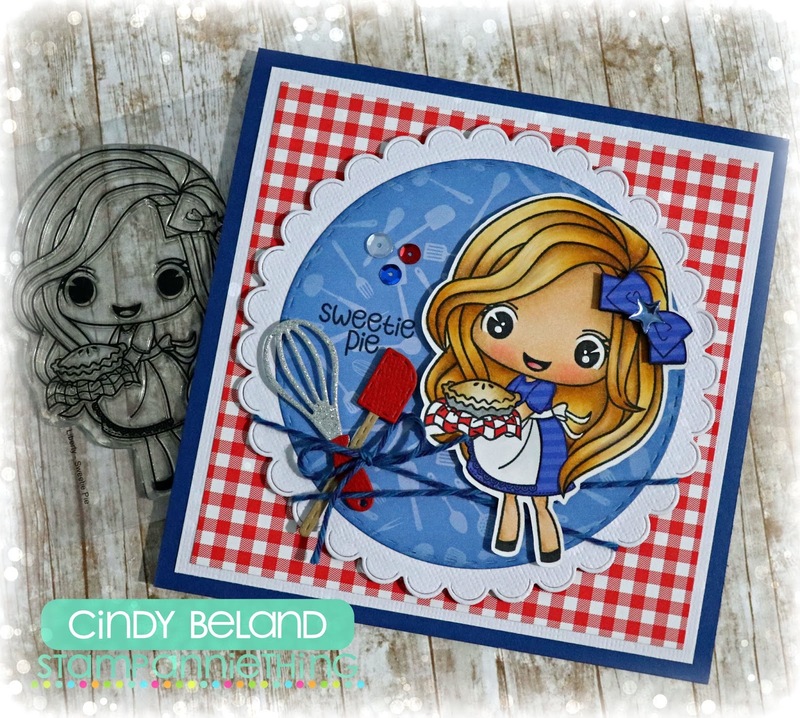 Create a project with a Stamp Anniething product and use a die. For my card, I used the Tag Die from Shaker Basics 2. Challenge Entries are submitted to the Stamp Anniething Facebook Group, HERE. and we got a lot of snow... oh I am so over winter!!! Under the Sea Dies for the look of snow, the Diamond Sparkles 4mm for inside my snowflakes and from Jaded Blossom I used Winter Banner dies for the snowflakes and the Flag Dies 2 for the banner. Victoria - Wanna Build A Snowman?